Wild animal parents will NOT reject babies if humans have touched them, so, as a human, you can help reunite babies with their parents. If the baby is uninjured and is furred and moving well, leave it alone, it will probably find its way, or its parent will find it. But check on it every so often to make sure that this has happened. If not, you can gently place the baby back in its nest if you know where the nest is located. If a baby mammal does not have all of its fur or is not walking well, put it in a box with soft, 'non-stringy' bedding (try to avoid terry cloth or cloth that can unravel) that has been warmed (if possible). Leave the box under a tree near where the baby was found. Don't hang around too closely or for too long, but you may want to check on the baby from time to time to make sure that it has found its way back to its parents. ​If you find a baby bird on the ground without all its feathers and the nest is not within reach or it has been destroyed, you can build a backup nest and put it as close to the original location as possible (see picture at right). Leave the area and watch for the parent birds to return. If the parents do not return within a short while, call a wildlife rehabilitor for help. If the animal IS injured, place it in a box with a hot water bottle wrapped in a towel (if possible). 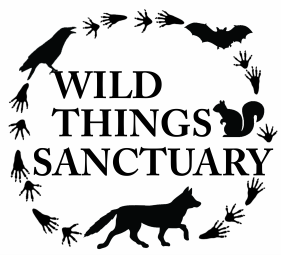 Put the box in a quiet, dark place and call a wildlife rehabilitator for help. Sometimes baby opossums fall off their mothers, but she'll take them back. A "backup" bird nest. To make a replacement nest, take something like a cool whip container, poke holes in the bottom for drainage, line with grasses or the original nest material, and attach to the tree. You can also use baskets for bigger birds (see below). 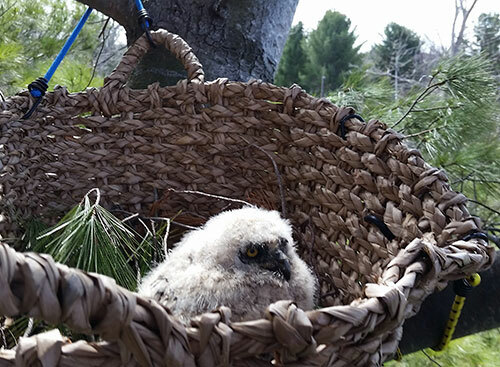 A young Great Horned Owl chick is secured back in her nest tree in a basket. The parents soon came back and raised her in the basket.